Warning! This post is a lot of complaining and elaborating about art making minutiae that may make you want to stab your hand with a pencil or click over to the Playbuzz quiz What Genre of Metal Are You? (I’m Industrial/Experimental). But if you have a creative addiction and like analyzing your monkey, read on. If my title is true, trying to impose some control over floppy noodles is more fun than it sounds because making art is my favorite pastime. But how is something so pleasurable simultaneously so maddening? Is my inability to control it part of the appeal? 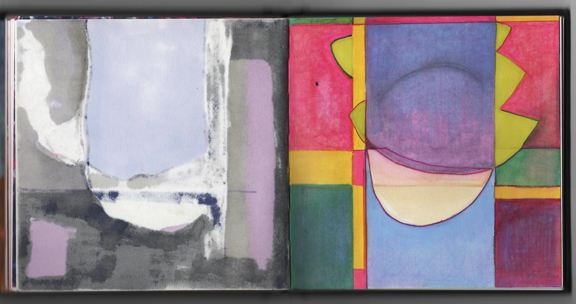 As I stated in my post Little Book of Abstracts https://eaglecrowowl.com/2015/01/25/little-book-of-abstracts/, I decided to do only abstract art in my then recent blank art book. It went exceedingly well and I completed all the pages by late March, 2015. I thought I would share more of that here but I made the process too tedious. I wanted digital access to everything so I started scanning each page, got bored and gave up, or lost consciousness of the endeavor and stopped. I think I told myself that I was to use my computer free time to scan rather than web surf but that didn’t pan out. Also, I greatly prefer making new art to documenting old art so that might have contributed to the loss of enthusiasm. Most of my blogging about this happened in my head. Any mind readers out there who enjoyed my psychic posts? Your welcome. 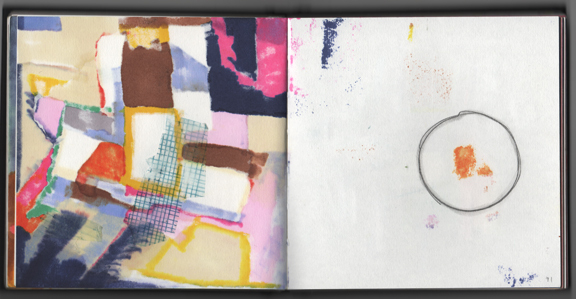 Upon completing book one, the most natural progression seemed to be making a Little Book of Abstracts #2. I looked around on the web for a square hardcover blank book and couldn’t find anything I liked, most had spiral binding which is the worst. 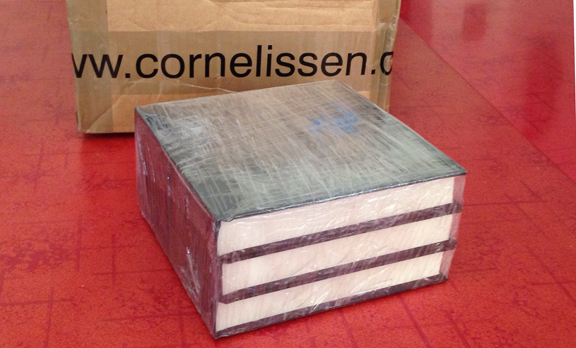 So I ordered 3 more blank books from L. Cornelissen & Son in London and paid the same amount in shipping as I did for the books themselves. So worth it! Take that frugal Caren. But no sooner had I done something a little extravagent, justified by previous success, than the mental momentum hit some existential traffic and productivity slowed to a crawl. Here’s what happened. 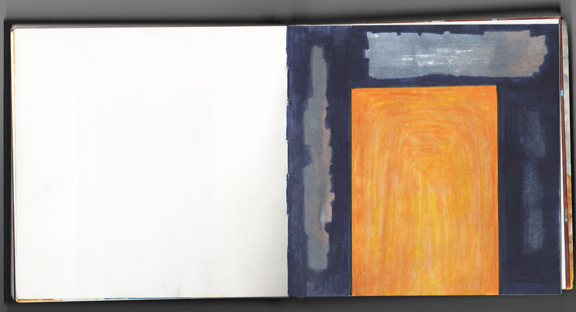 In book #1 I did the pages out of order, so for a long time many of the spreads had an image on one side and a blank page on the other. It looked nice and clean. 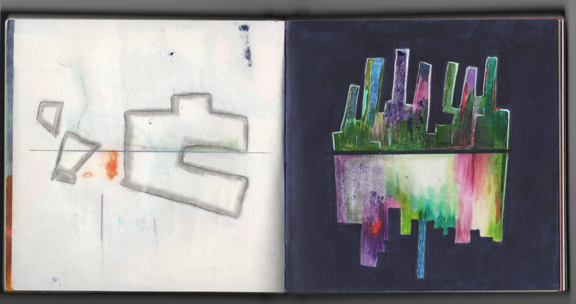 However, a number of the spreads had images on both sides as sometimes I would do a theme and variation kind of thing. The inconsistency bothered me so I decided there should be imagery on every page. A cool thing started to happen where I would pair a dense marker based image with a light and subtle pencil based image. 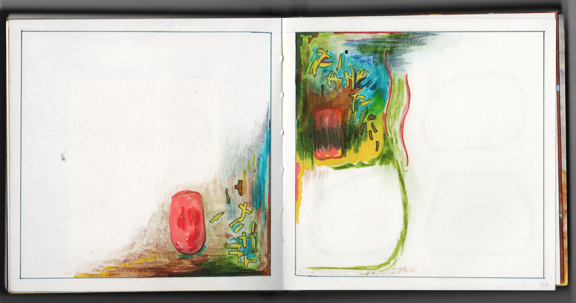 Nevertheless, as the book filled out, I started to miss the clean blank pages and several drawings I felt were harmed by the newer drawing they got paired with. This bummed me out. I told myself that in the next book, there would only by one drawing per spread. So the rules for abstract book #2 was one drawing per page and they would be drawn in order, first drawing on page one, second drawing on page two, etc. I wanted to rebel immediately but told myself stick to the plan! I really liked my first drawing but for whatever reason, my second drawing was of a radically different style. They did not sit well together. In the first book that wasn’t a problem as they would be separated by mulitple pages and I would make the art between them harmonize. Now I didn’t have that option. Seeing these two disparate images together every time I opened the book galled me. 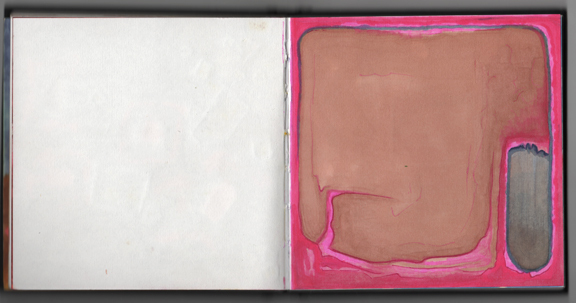 The problem just got worse, each successive page seemed to relate less and less to what had come before. Instead of feeling joy when I opened the book, I felt irritated. This is what I get for paying $30 in shipping! I am always torn between rules and no rules. Of course there are always some rules. Whether you consciously create and follow them or take notice of them after your effort to see what they were, they are there. For example, a medium is a rule. If you are using markers, you aren’t using paint so the rule is markers. A rule is just a choice and art is full of choices. I have been paying a lot of attention to whether I am making my choices with my conscious mind or unconscious mind and to what effect. I think the most interesting stuff comes from the unconscious. No sooner does it come out then my conscious mind seizes on it and wants to make rules to help us get more. But the rules often backfire, like they did in the second book. It’s so frustrating. Some where around the time I was finishing the first and starting the second book I had an idea for another abstract project with another set of rules. I would make larger abstracts on individual pieces of paper and get a frame I could put them in so that I could hang it up and see the work. It’s hard to get the little books to prop up and stay open so that I can step back and look at the art from a distance. More on that project and how I think the unconscious works in art later. Or tune into my live and uncensored psychic podcast where I do mental mixed martial arts cage fighting with myself while drawing more nonsense for no good reason because I am free and I can do as I please.